Singer-Songwriter Alexander Vlachos is a Detroit, Michigan-based musician. The style of music that Vlachos makes contains both a folk and jazz quality to it. The resulting music is fresh as it has a sound that brings to mind folk artists like Simon & Garfunkle, Jason Mraz and several other artists. Vlachos performs under the moniker of Greater Alexander. 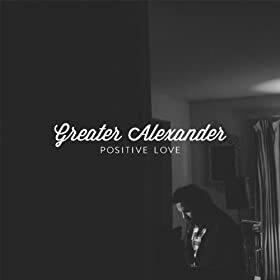 The new album from Greater Alexander is called Positive Love. Positive Love was mostly created by Alexander Vlachos as he played the large majority of the instrumental parts that help create the songs. As a result of those songs that contain only Vlacho, the majority of the album has a sparse feel to the music. On the few tracks that feature more than just Vlachos by himself, you get a bigger, fuller sound. The first track off of Positive Love from Greater Alexander is “Any Way out of It”. The first thing you notice when you listen to the track is how much the track sounds like a song that would have been created by Simon & Garfunkle. It is the vocalizations by Vlachos that really brings to mind that famous folk-rock duo. The song also features a simple guitar part that will remind you of songs created by Simon & Garfunkle. Positive Love from Greater Alexander continues with the title track. The African stringed instruments on the track “Positive Love” give the track a very interesting sound while still maintaining the folk feel that was present on the track “Any Way out of It”. The track has a feel to it that is similar to that of “I’m Yours” of Jason Mraz. With the track of “Baby Steps,” the resulting track from Alexander Vlachos has more of a full sound to it than most of the tracks as percussionist Bryan Arnold joins in with Vlachos and gives the track just a little more rhythm. The resulting track has a style that will bring to mind songs from the likes of people like Jack Johnson. One of the strongest tracks on Positive Love from Greater Alexander is the song “Better Days”. The track features some of Alexander Vlachos’ strongest vocals on the album. The lyrics will also stick with you as they are very upbeat and will have you wishing for those “better days” to come. The music of the track is stronger than most of the tracks on the release as it features Alexander Vlachos who has been joined by Bryan Pope as Pope adds violin to the track. The vocals on the track once again seem to be very powerful as Vlachos adds many levels to the vocals and creates three-part harmony to the lyrics. “Better Days” is easily one of the most commercial tracks on the album. While most of the tracks on the album feature Alexander Vlachos and his guitar, the song “Everlasting” is one of the tracks that also feature Vlachos on the piano. The sparse piano playing on the track helps to add a slight beauty to the song while it also helps to separate the track from the majority of the rest of the release. Percussionist Bryan Arnold once again joins Vlachos and gives some added texture to the track. The track turns out to be one of the most entertaining tracks on Positive Love. Alexander Vlachos returns to a more simplistic feel to his music on the track “Negative Fears”. And while the song features only guitars and Vlachos’ voice, the track does feature a layered feeling to the guitars as they give the music a beautiful quietness that adds to the somewhat strong subject matter in the lyrics. Positive Love from Greater Alexander comes to a close with the track “In the Stillness of Water”. The track begins rather quietly as Alexander Vlachos describes a peaceful scene of tranquility. The song slowly builds to include a full-bodied sound that includes light percussion and keyboards. The song continues until it returns once again to a quieter feeling that fades out. Positive Love, the new album from Alexander Vlachos’ moniker of Greater Alexander, is an enjoyable release of modern-day folk music. If you happen to be a fan of folk music, this release will have something for any lover of the genre. Click HERE for the video for “Any Way out of It” from Greater Alexander. You can also check out the Positive Love album from Greater Alexander HERE.